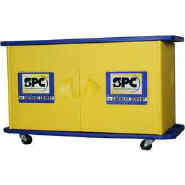 Holds up to a 38" roll and full bales of product - no special refills required! Worker productivity and efficiencies can be improved dramatically by placing Sorbent Centers strategically around the facility and closer to the areas of need. For both emergency response and routine maintenance and safety, you don't want employees wandering away from their workstation to the other side of the plant or tool room to check out the sorbent materials they need. The inside of each door is indented for you to post your organization's safety guidelines, ISO requirements or the "What To Do When A Spill Occurs" label included with each Sorbent Center.